A fantastic fact-filled voyage through your body, from your brain to your biceps, from your eyes to your toes with an absolute ton of flaps to open and discover... Usborne are still leading the way when it comes to producing brilliant informative books for curious kids. A perfect choice for young children. 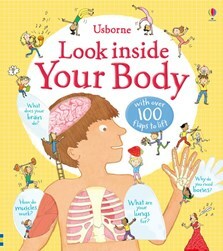 The Usborne 'Look inside' range is a truly fantastic collection of educational and interactive fact-packed books that teach children about important and useful subjects in a fun and informative way, and the Look inside: Your Body book is certainly no exception! A must-have for the bookcase...a superbly written and designed factual book that covers the ins-and-outs of the human body in a way that young children will love learning about. Interesting Book that my daughter loves it so much. She is only 2.5yrs. Great! I bought this at a book fair for my grandchildren to read at my house. I love learning about the human body and how it works, and hoped I could share it with them. Well my 4 year old grandson can't put it down, we love sharing the information in this informative book together. I highly recommend it! This was my first purchase from this company, I look forward to many more. I'm 6 years old and I love this book. It give me lots of facts about my body and it is really fun to read with the lifting flaps inside. I would definitely recommend this book!